Pitchers in the early 1920’s did not look forward to seeing Heinie Groh in the batter’s box. Not that the Cincinnati Red’s lead-off hitter was a big man. Standing just 5’8″ and weighing 158 pounds, the little infielder was no threat to go deep. Nor did they dread his eagle eye, peppery disposition or peculiar wide-open stance. No, it was that thing he carried on his shoulder. What was it? A potato masher? A wooden bottle? Nope. It was a “bottle bat,” the first of its kind. It had a long, even, wide body for most of its length, but tucked in abruptly at the “bottleneck,” where Heinie wrapped his callused hands. Writers and historians have since given it various names — “bottle bat,” “bottle club” or “Heinie Groh bat” — but they agree that what this style of bat lacked in grace or whip, it made up for in surface area. If the man on the mound offered up anything in the neighborhood of the strike zone, Groh was likely to get a piece of it. Even an inside pitch, that might whistle harmlessly over or under the tapered handle of a normal bat, met some timber with a bottle bat. Smaller men for years to come would follow Heinie’s example and use bottle bats to make contact and push the ball into play. Given the pioneering aspect of Heinie Groh’s bottle bat and the circular nature of history, it stands to reason that in the fullness of time someone had to make a “bat bottle.” And given baseball fans’ longtime love of beer, it’s only right that it be a brewery. Fulfilling this historical imperative, in 1996 the Coors Brewing Company introduced the industry’s first bat-shaped bottle, a packaging celebration of America’s favorite pastime. The amber glass bottle stood 11 1/2″ high and sported wood-grain texture on the “barrel” with stripes resembling tape-wrap on the “handle,” all molded directly into the glass. The Coors Light and Original Coors labels were ceramic-fired where the bat’s label would be. There was even an “18” on the cap, right where you’d find the ounces on a Louisville Slugger. Sales of the new bat bottle were as lively as Heinie Groh’s wrist action. In tones that were at once thrilled and apologetic, the Coors Brewing Company noted that entire displays disappeared within an hour or two. In addition to dovetailing with baseball tradition, the Coors bat bottle fit nicely into 200 years of America’s bottle-making history. In the late 1700’s when America’s chosen tipple was whiskey, distillers competed avidly for the favors of the drinking public. They turned to bottle makers to provide unique flasks and bottles that would enhance their product’s image and provide an extra incentive for the buyer to purchase their brand. One early inspiration was bottles decorated with patriotic designs. The American eagle was wildly popular, and this was followed in short order by a bottle bearing a molded portrait of George Washington who thereby became not only the father of our country but also one of its first celebrity endorsers. Glassy portraits of other presidents and notables appeared soon thereafter, including Andrew Jackson, Benjamin Franklin and General Lafayette. As bottle makers became more adept, they graduated from decoration to reshaping the entire bottle. When William Henry Harrison campaigned for president in 1840, his partisans cheered him on with whiskey from bottles in the shape of a log cabin, a reference to his humble origins. The cabin bottle was such a hit that it was quickly copied by a Philadelphia importer of wines and liquors who went by the euphonious appellation of E. C. Booz. From 1840 to 1870, E.C. Booz’s Old Cabin Whiskey did much to popularize the word “booze” as a synonym for hard liquor. The cabin was the first “figural” bottle, but many shapes followed. When saloons and liquor stores gave away free samples, they used small bottles shaped like pistols, pigs or jolly little fat men. As the Prohibition movement spread in the late 1800’s, a great many people turned from drinking whiskey to “medicating” with high-proof patent medicines whose bottlers’ imaginations ran wild. Indian Empress Herb Bitters came in a bottle shaped like an Indian maiden. National Bitters came in an amber ear of corn, and the undoubtedly tangy Doctor Fisch’s Bitters came in a bottle shaped like a fish. Brewers also sought to rise above their competitors, but, given the pressure of their carbonated beverage and the need for cleanliness, they had to refrain from packaging their product in all but the sturdiest and most straightforward of bottles. However, they found other ways to appeal to their customers, especially those who enjoyed a day at the ballpark. In the days before air conditioning and domed stadiums, brewers gave away cardboard fans to the ‘fanatics’ in the stands. The fans usually featured a picture on one side — perhaps of the brewery or an attractive woman — and a few kind words for the beer on the other. Peter Doelger, a New York brewer, gave away small scorekeepers made of Celluloid — the ivory-like forerunner of modern plastics — to keep track of runs, hits and outs for the “Home Club” and “Visiting Club.” Other brewers offered printed schedules of home games, baseball-themed calendars, coasters and buttons, promotions that continue to this day. And in 1996, at a place where collectible advertising and the art of the American bottle maker meet, the Coors bat bottle introduced “Coors Light Presents USA Softball World Series” promotion. One can easily imagine the thirsty victors celebrating with an 18-ounce bat bottle of Coors. 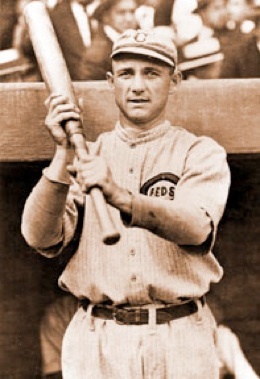 Which, to a few of them, might bring to mind Cincinnati’s wily second baseman, Heinie Groh, striding to the plate with a glint in his eye and a bottle bat on his shoulder. A version of this article first appeared in a press kit for the Coors Brewing Company in April 1996. The photo of Heinie Groh was provided by the wonderful librarians in the photo library at the Baseball Hall of Fame, Cooperstown, New York.